I've had Niki Nakayama's food five times now and she's never failed to impress. With my last visit being over a year ago it was well past time for another trip to n/naka. 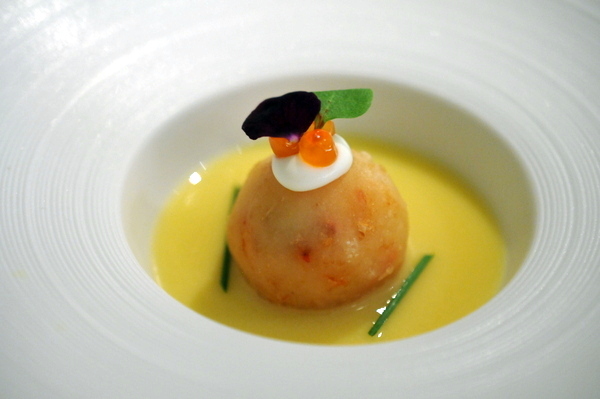 The first course was designed to pair something common with something unique and the delectable sphere of lobster and potato is just that. 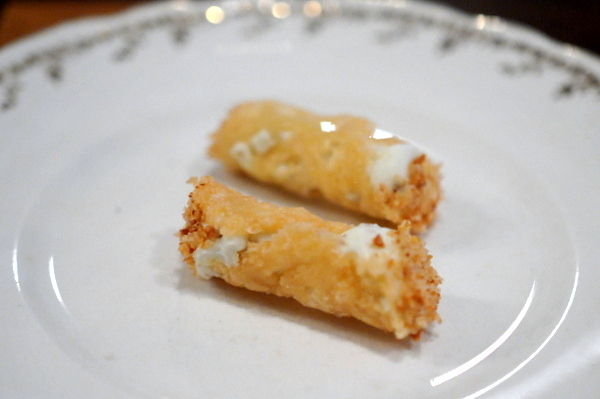 The creamy potato is flecked with bits of lobster sort of like a gentrified seafood croquette. The warm savory mixture is further highlighted by the sweet cold cream soup and a delicate citrus perfume. 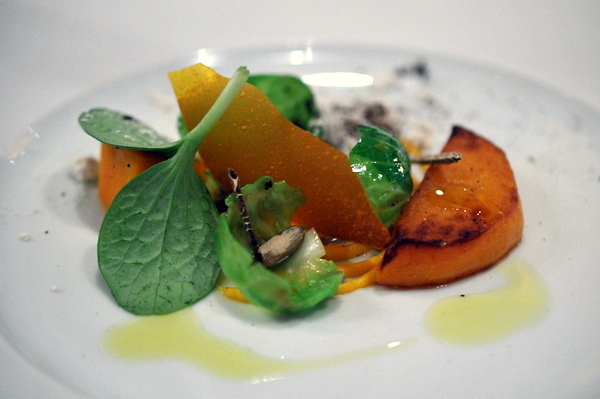 Niki took a more traditional approach with the second course, a mix of appetizers emphasizing seasonal fare. First up was more lobster this time in shumai form with a filling that emphasized the snappy texture of the lobster and a numbing spicy dipping sauce. Next up were two slivers of duck that offered the perfect ratio of tender breast and oily fat topped with succulent fragrant onions. Third was a multifaceted blend of snappy calamari stuffed with creamy blue crab. 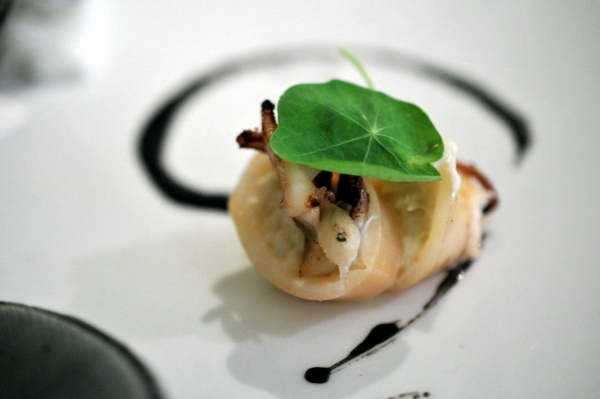 The morsel came with a streak of squid ink that imparted an earthy relish to the dish. After all that the final course of Poké felt almost passe though it was still some of the highest quality Poké that I've ever had. Jumping back to the contemporary side of things we were presented with four slices of alabaster perfection. The creamy mild mollusk reverberates with the flavors of herbaceous bell pepper, sweet kiwi and tart citrus. Despite all that was going on, I would have liked a bit more savory emphasis on the dish. One of the joys of late fall and winter is Matsutake season. 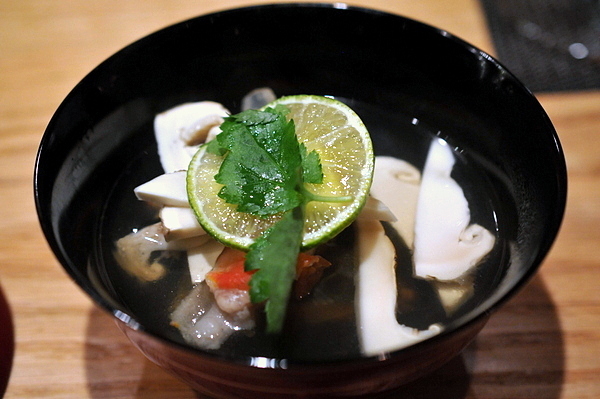 The mushrooms have a distinctly sharp woody aroma that lends itself well to soup. The dashi broth is on the lighter side, still savory but leaving plenty of room for the twisting sour twang of the citrus as well as the flavor of the mushroom. 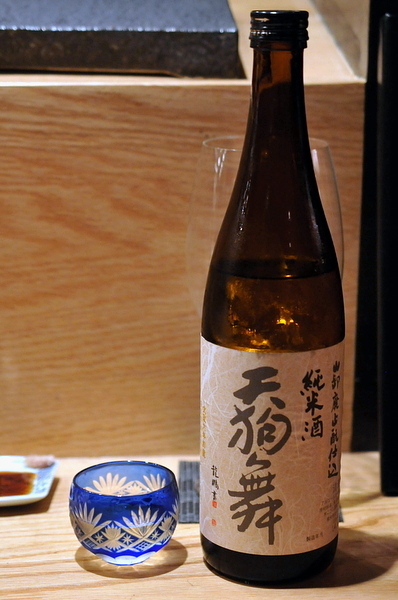 The accompanying sake is equally as focus, bursting with floral grace but finishing sweet and clean. 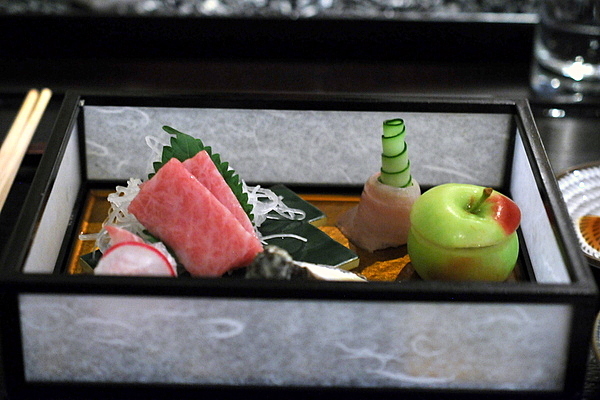 Our fifth course consisted of little treasure boxes filled with a variety of immaculate sashimi. The O-toro was an obvious standout, as was the uni, but the nama tako was probably the most unexpected surprise the fresh octopus has a supple slickness that I find enchanting though I recognize it might be off-putting to some. 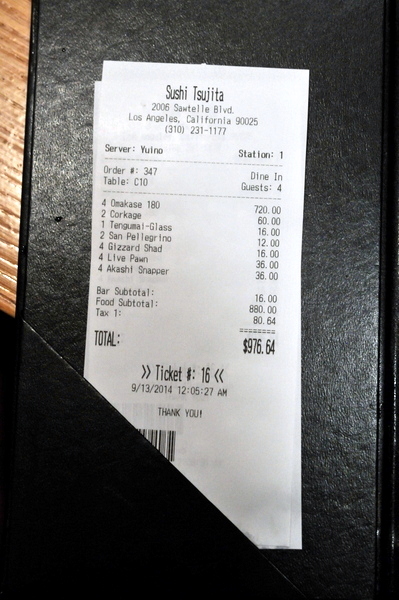 This was probably the weakest course of the night for me. The grilled fish has a distinctly firmer texture than most of the other courses and the vinegar-ed sauce was a touch too astringent for my liking. Things got right back on course with the steamed dish, a little bowl of silken egg custard filled with treasures like uni and snow crab. If that wasn't enough the course is finished with a generous topping of white truffle imparting an elegant fragrance to the bounty of hearty egg and heady shellfish. I'm not sure if this is Niki's signature dish, but I've had the good fortune to try it on each of my last two visits. 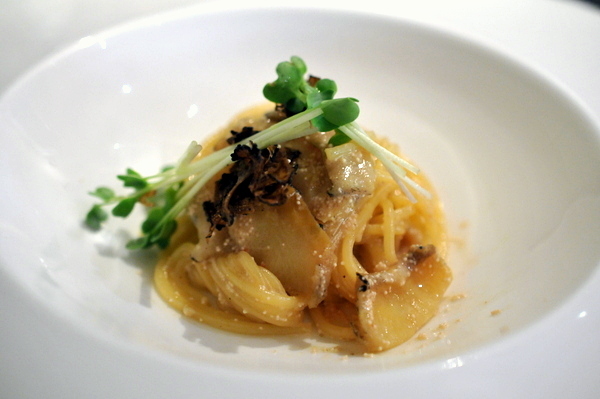 The pasta is cooked very al dente and dredged with pungent cod roe. Slices of abalone and Burgundy truffle add depth and texture to the dish while the sprouts bring the the slightest touch of cool verdant relief. It goes without saying the beef was cooked perfectly, tender and threaded with abundant marbling it was like biting into a pillowy cloud of beefy decadence. The accompanying vegetables are cooked perfectly keeping their inherent flavors and crispness while picking up a hint of char and nuance. The wine was a prototypical Bordeaux but the structure and more austere notes of tar, cocoa, and deep red fruit do well to wash down the weightiness of the meat. 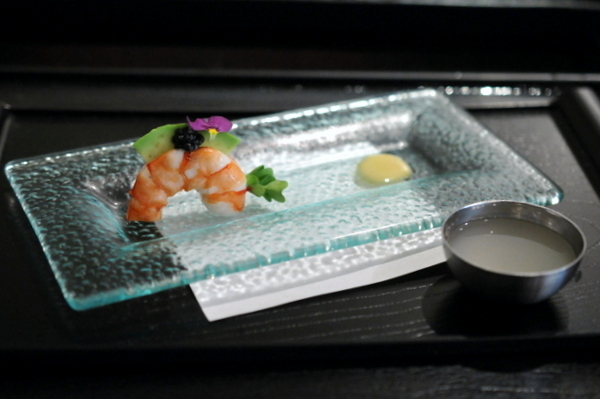 Our final plated course before the nigiri was the evening's "salad" The still-rare prawn is immaculately dressed with avocado, edible flowers and a touch of caviar. The accompanying white miso adds a slightly funky sweetness while the cool chaser of sweet Yuzu Omoi provided a pleasant punctuation to close the Kaiseki. Nigiri time! First up was a thick cut of sea bass the warm pink flesh has a jellied consistency and the coolness of the fish works beautifully against the slightly warm rice. 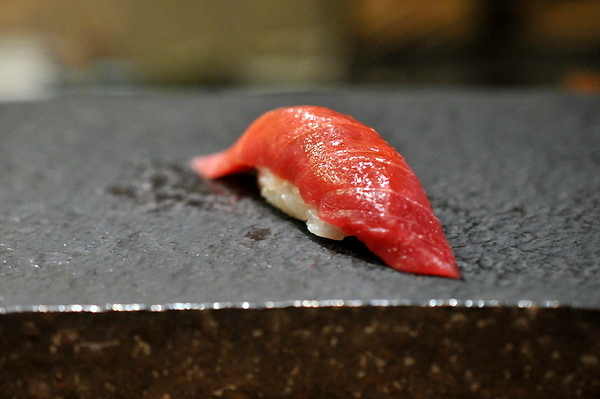 Next up was more of the fabulous toro this time in nigiri form. The fish doesn't have much apparent marbling but despite the understated appearance the fish still gives off a decadent oily relish. 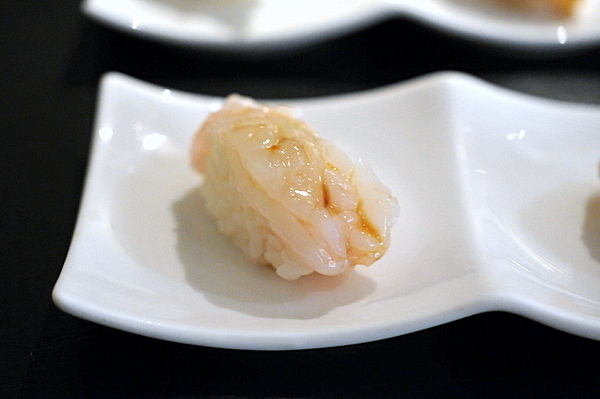 The second plate of sushi began with a lovely amaebi the supple white flesh comes coated in a fine layer of shoyu giving some much needed savor to balance the prawn's inherent sweetness. The aji had a deep lovely redness shaded with bright silver skin. The bite of the grated ginger tempers the Mackerel's fishy heft. 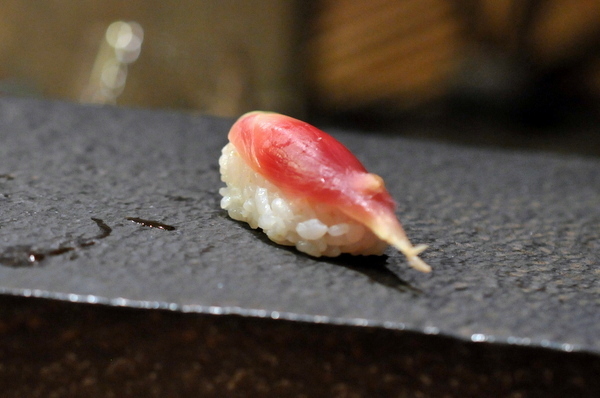 This was the evening's most elaborate sushi presentation, the thin sliver of mirugai comes sandwiched between a dab of yuzu kocho and a sliver of shiso. 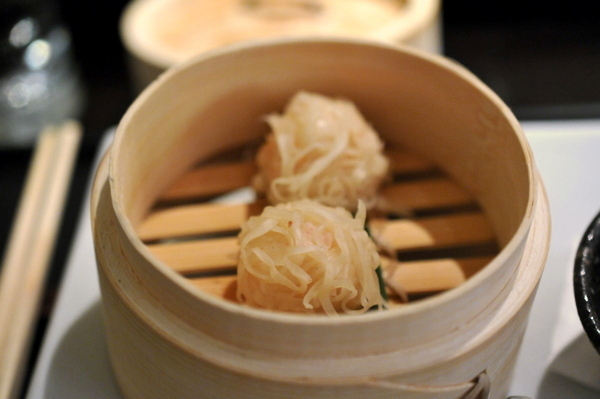 The combination gives the geoduck a mix of brash tangy spice and floral elegance. 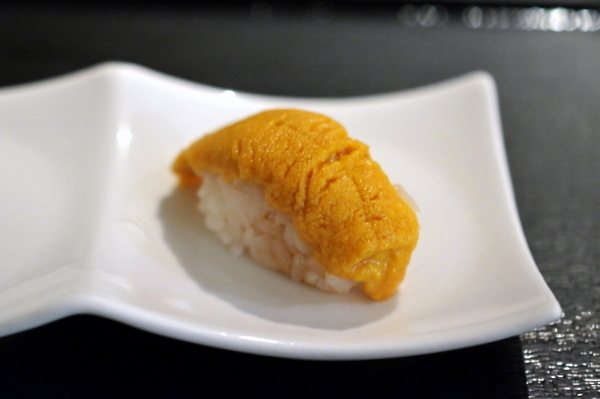 The nigiri ended on a high note with a minimalist uni preparation. The bright orange roe comes without the common nori wrapper. The result is unfettered sweet saline luxury wrapped in a lush creamy package. 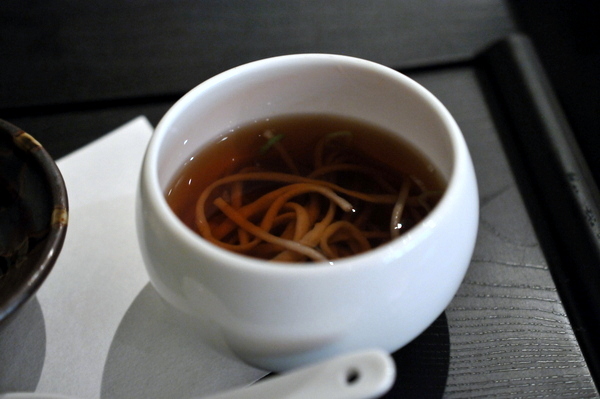 The final savory is a simple no-frills bowl of soba in a warm dashi broth. The dish feels almost laughably simple compared to the rest of the meal but the simplicity makes it easy to appreciate the homey warmth and perfect texture of the noodles. Dessert consisted of a sampling of treats. 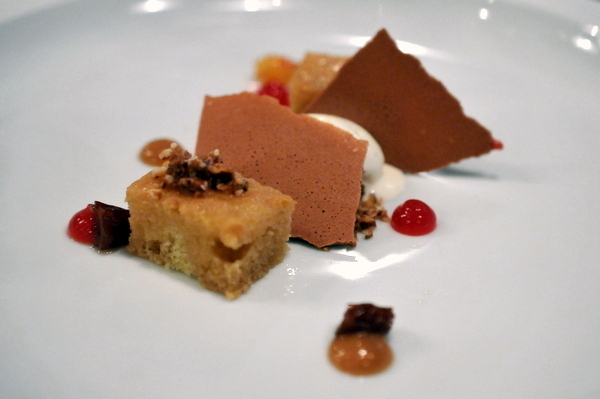 The desserts are enjoyable enough but lack the finesse of the savories and feel like almost an afterthought. To be fair, the desserts are better than the typical Sushi restaurant fare, but the most interesting part of the dessert was the wine pairing. 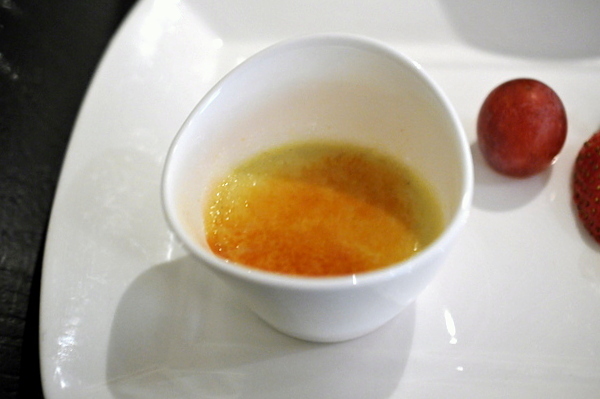 A shot of golden sake that starts out with a Juicy Fruit like sweetness that picks up a rising heat. After six visits, the progression of courses has become a bit predictable but the technique and quality are as impressive as ever. This marks my third trip to Maude this year and it has been one of my most anticipated meal since I first learned about it. For those who don't know, Maude's menu is based around a theme ingredient that changes every month and this month's ingredient is the always-prized Truffle. 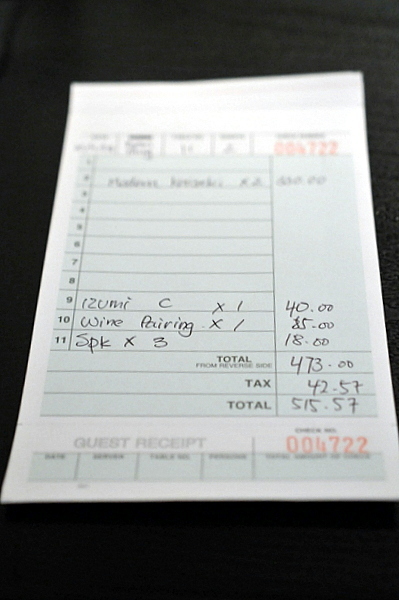 Getting a reservation at Maude requires persistence and luck in any month and November was sure to be worse than most. 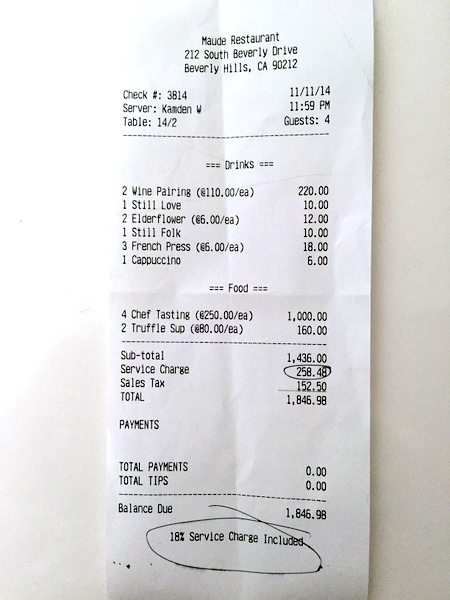 Indeed I called over 100 times with no luck but fortunately another of my dining group managed to make it through. As always, the meal at Maude opened with a couple snacks. First up was a mini-cannoli filled with creamy ricotta spiked with a soft fragrance of white truffle while the shell itself was reminiscent of a tuile both in terms of texture and its slight sugary sweetness. Our second little bite was an uber-luxe Pop Tart. 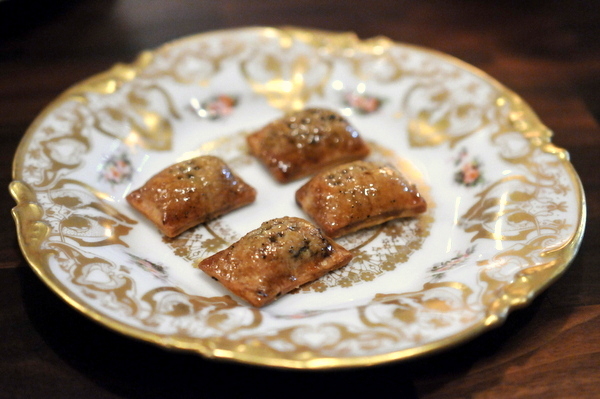 The bite has a toasty crumbled texture as one would expect as well as a pungent onion sweetness tinged with truffle. 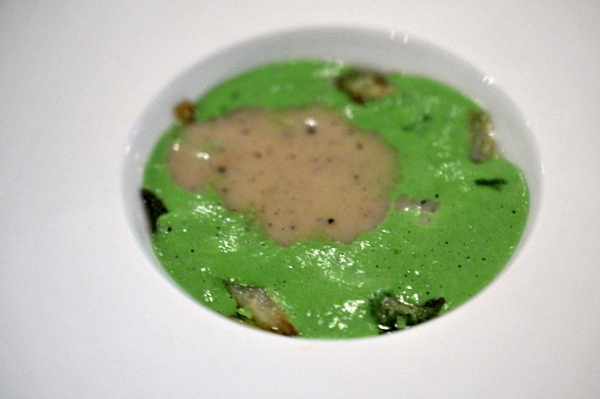 Moving on to our first course we were presented with a verdant cream of kohlrabi and escarole over which our servers poured a hearty cream of potato and truffle soup. 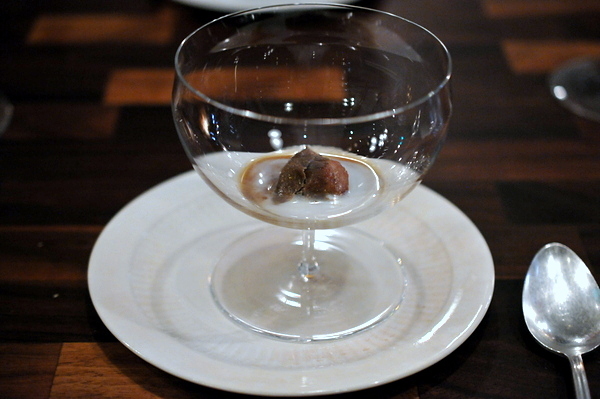 The truffles come through clearly in the rich brown potage but the bitter nutty restraint of the vegetables helped temper the mixture. 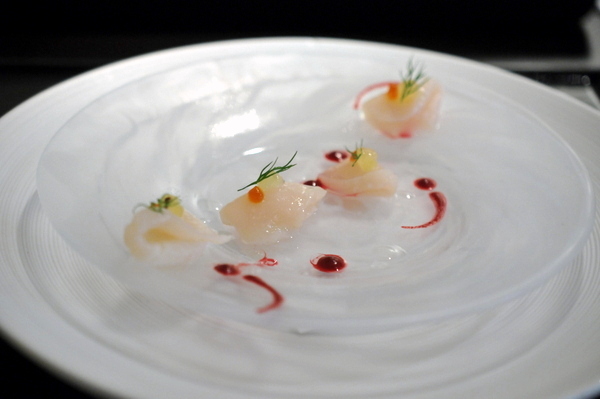 The words scallop crudo are pretty much always music to my ears. Maude's rendition is less a true raw preparation as it is seared on one side. Though still rare I found the texture a touch firmer than I'd like, the flavor was a superb mix of saline-sweetness and a perfect compliment to the rough crunchy soil of truffle and hazelnut. The pickled salsify was a wonderful addition, bringing a crisp succulent brightness while the dollops of beet juice added an intense but short lived sweetness that complimented the dish nicely. Eggs and truffle are a classic no brainer, and indeed the silky yolk coupled with the Alba truffles are a thing of beauty. Still Chef Stone doesn't stop there, resting the yolk on a bed of soft creamy leeks and a sprinkled with smoky bits of brioche. The combination made me think of a truffled bacon vichyssoise and was easily the most overtly delicious course of the night. 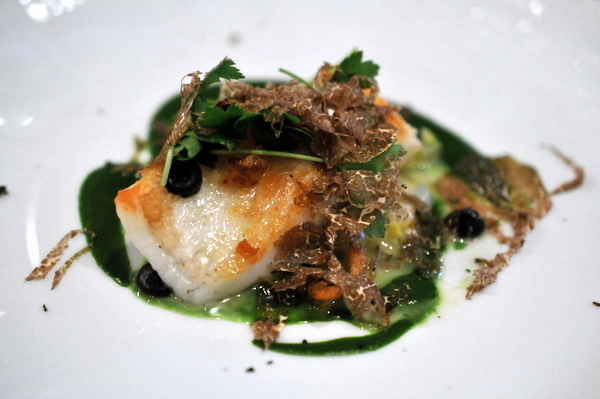 The fish course consisted of a beautifully seared turbot. 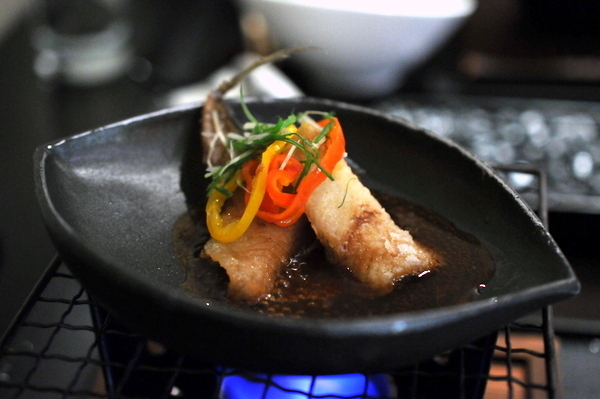 The flaky white fish is more full flavored than most preparations especially with the earthy truffle imparting a smoky relish. Meanwhile the tangy verdant blend adds an extra dimension of countervailing flavors. In a departure from Maude's normal format, we were offered a choice for our pasta course, either tagliatelle or risotto. Naturally we opted to try both and share. First up was a very al dente pasta, dressed table side with a generous shaving of white truffle and splash of brown butter, pure simple and delicious. Truffle risotto has long been one of my favorite things in the world and like the tagliatelle, the risotto was prepared simply really little more than a vehicle for enjoying the earthy fragrance of the white truffle. The next course was almost a savory intermezzo. A single tender morsel of offal-y sweetbread served in a earthy sweet sauce made from cauliflower and black truffle. The final savory was a beautifully crimson slice of seared venison. The meat is quite lean showing off a steely character. The parsnip and chocolate help round out the meaty heft but are a bit too sweet. 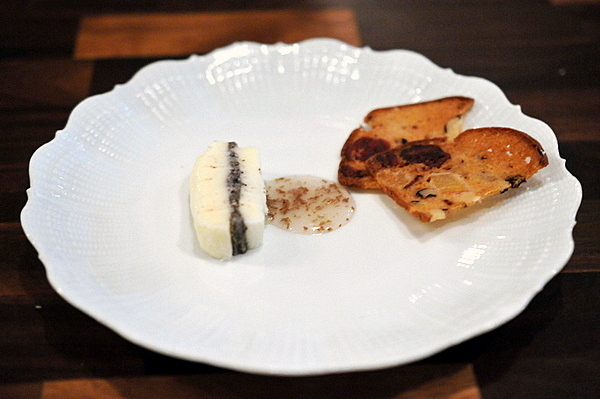 The sprig of grilled Matsutake proved to be the critical element thanks to a woody musk that ties the plate together. 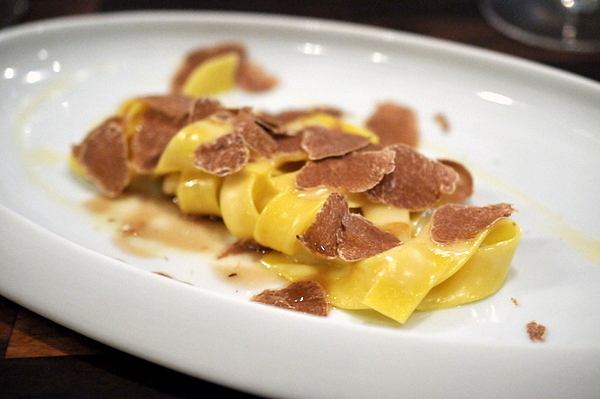 Our cheese was a mild semi-soft variety that served as an excellent medium for the crumbled black truffle. The white truffle honey provides a brighter floral counterpoint to the weighty black truffle while the toast adds a much needed textural contrast. 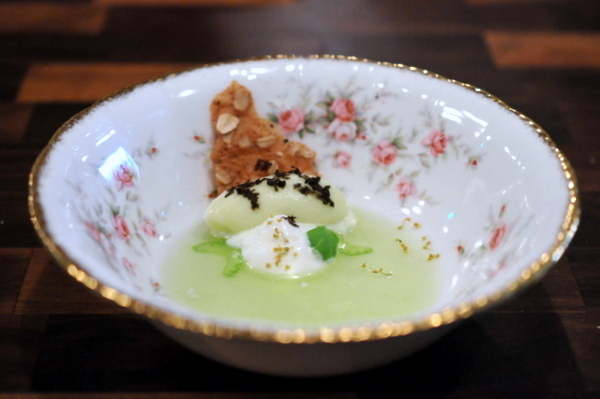 Our first dessert started as a soothing mixture of bright green candied apple and tangy yogurt but the celery infused soup adds a cerebral bitter wrinkle to the mix. Our formal dessert was a rich toffee cake soaked in lemon giving the pastry a built in restraint. 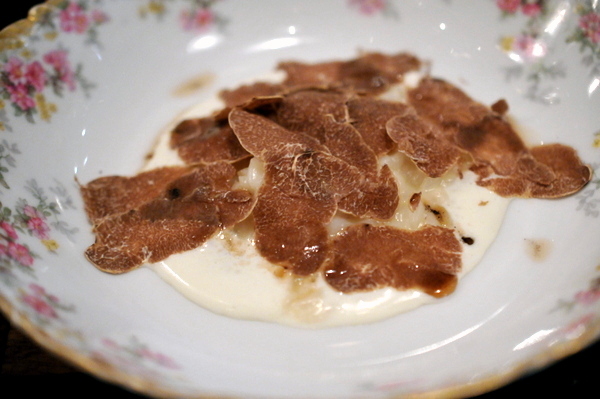 The truffle vanilla ice cream was equally impressive suffusing the palate with an even truffle and vanilla bouquet. Our meal ended with three superb little treats. 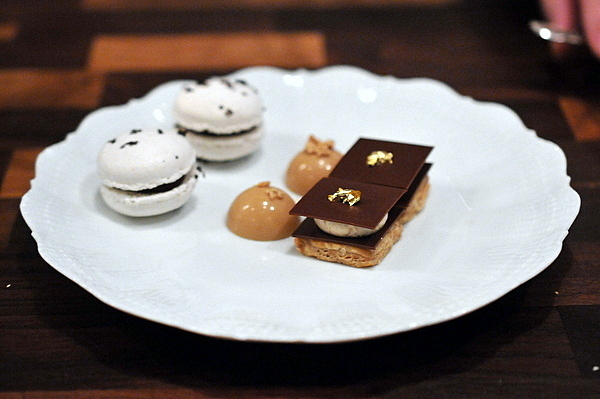 The Truffle and Macaron were straightforwardly delicious where the Palet d'or was a bit more complex with a buttery puff pastry contrast to the truffled and chocolate. 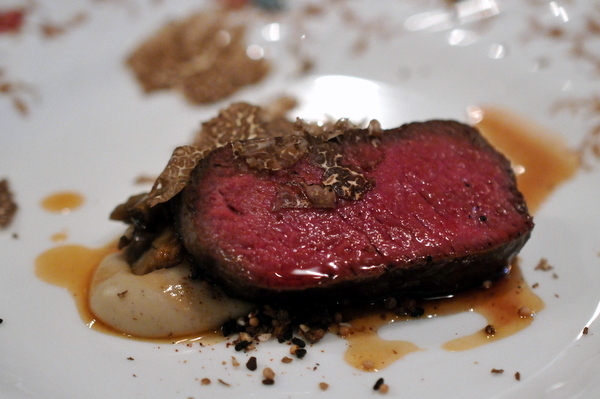 As expected, Chef Stone delivers once again, putting together a menu showcasing the versatility and range of truffles. Some courses follow classic approaches that celebrate the sublime musk of the prized fungus while others take a more cerebral approach using truffles to compliment or enhance. Recently an article came out about Curtis Stone saying that he opened Maude to prove he was a chef and not just a TV personality. Judging from my three experiences I have to say mission accomplished! I gotta say I had my doubts when I first heard about this place. Tsujita made his name on the strength of his ramen. His initial restaurant Tsujita L.A Artisan Noodle was so popular he had to open another spot (Tsujita Annex) to handle the overflow so I was a bit skeptical when he opted to open an Edomae-style sushi spot. Still I was relieved to hear that Tsujita hired Shigeru Kato, a sushi chef with 35 years of experience to lead the restaurant. That and the good initial reviews were enough to pique my curiosity. 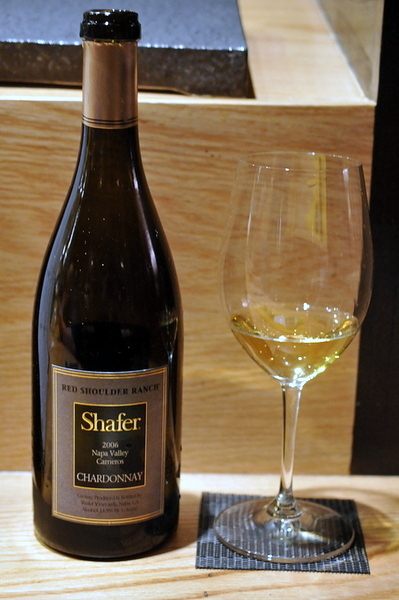 Rather than stick to our usual routine of ake, we opted to bring a couple chards to pair with the meal. First up was a rich full bodied Chard, the aroma couples an apparent butteriness with a countervailing green fruit acidity; while the palate has additional unexpectedly heavy notes of caramel. 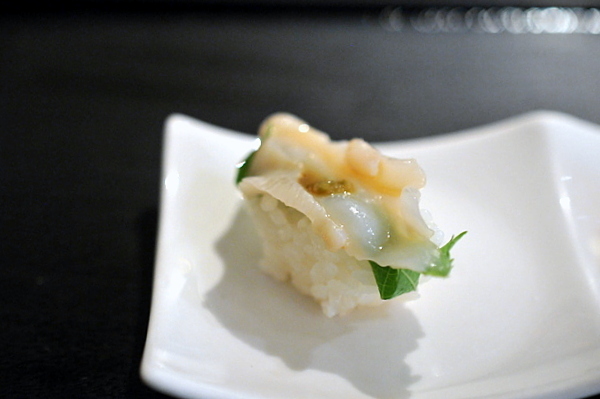 The meal got off to a strong start with abalone cured in kelp then steamed to a sublimely delicate tenderness. 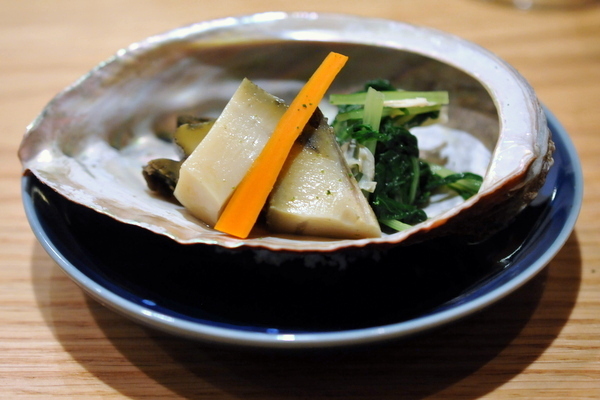 The abalone's inherent flavor is deepened by the savor of kelp. 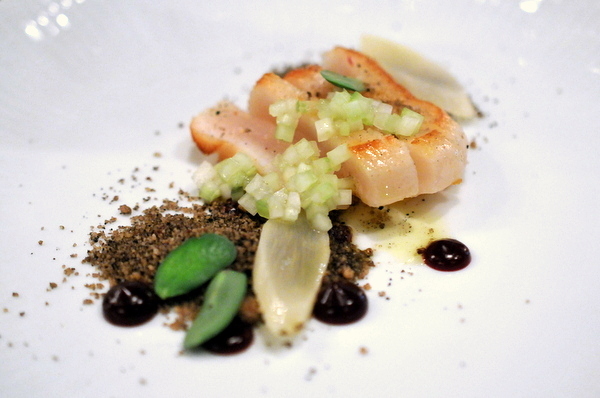 The touch of citrus adds a cool fragrant levity while the vegetables highlight the abalone's earthy heft. A sliver of piquant pickled carrot conveys a streak of sharp discordant acidity that shakes up the conventional flavor profiles. 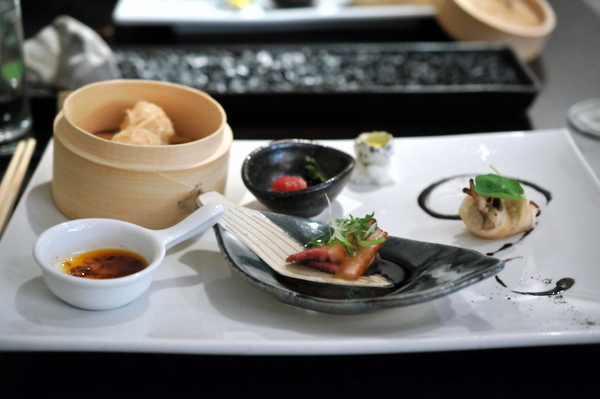 The second course was actually a series of small tastes. 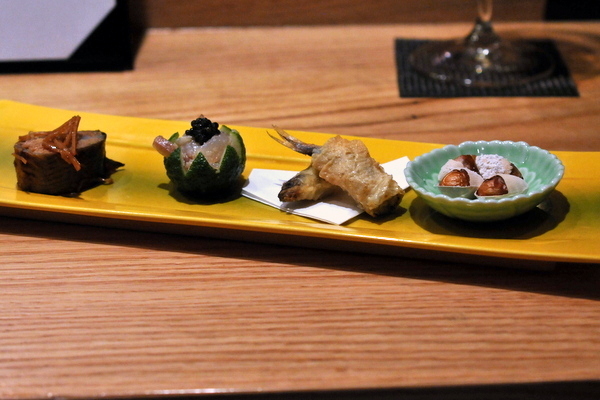 First up was a quartet of salt grilled ginko. The crust can be a bit over salted, but the sweet nutty flavor of the nuts gives way to a pleasant earthy bitterness. 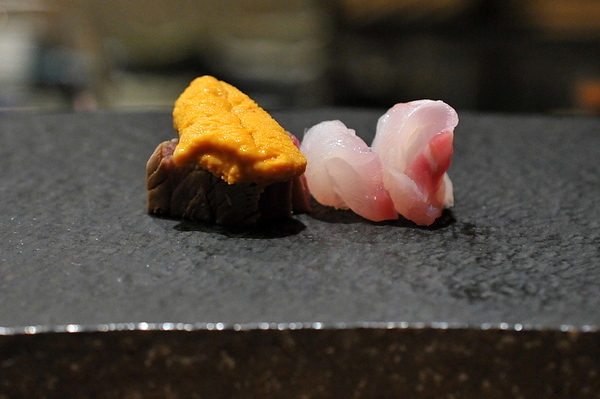 The remaining appetizers were an interesting study of Ayu or Sweetfish. First up was a deep fried version of the fish that tasted like a cross between fish and a potato chip. 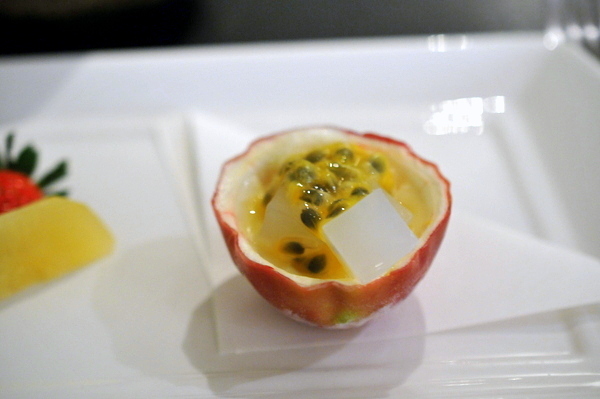 Next up was my favorite, raw strips of sweetfish are paired with punchy caviar and a subtle citrus twang. 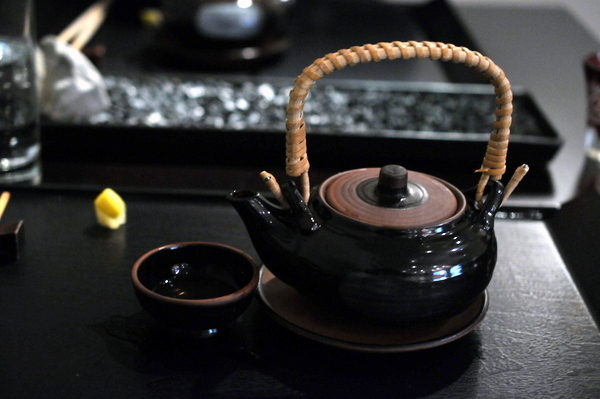 The third version was a lightly simmered preparation loaded with a complex melange of sweet soy, ginger, and umami though the texture left something to be desired. Next up was a classic clam broth enriched with rockfish, mushrooms and citrus. 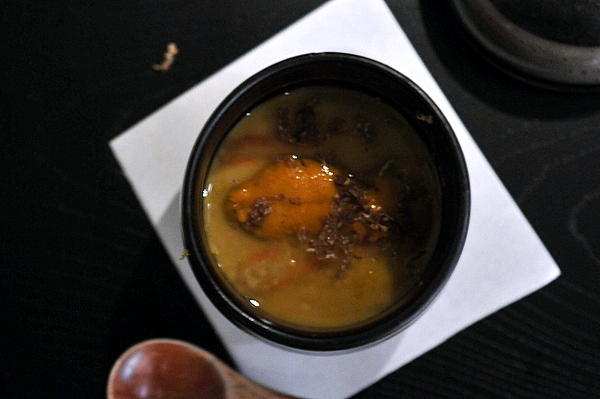 The broth itself has a clean subdued salinity coupled with a woody autumnal warmth from the mushrooms. 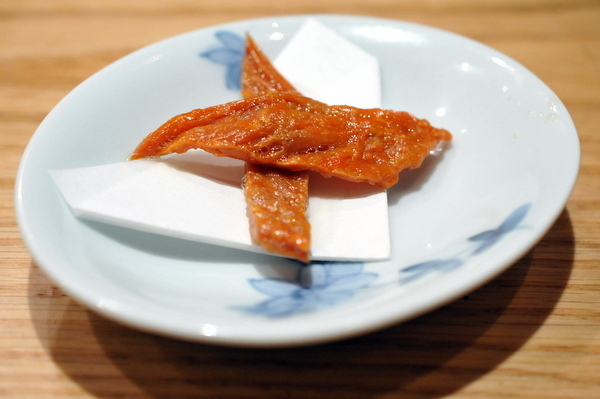 The accompanying herbs add a streak of bitter aromatics while the slice of Kabosu imbues the mixture with a mouth puckering twang. Next up was an small but sublime sashimi course. I started with the marinated Bluefin drenched in aggressive soy savor and paired with a sweet countervailing envelope of creamy uni. 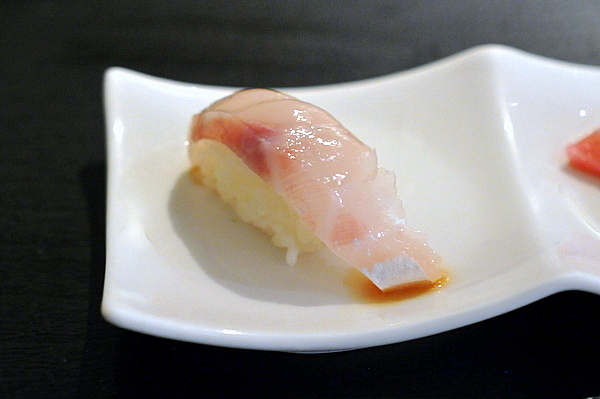 The Hata or grouper had a much more nuanced flavor with oily flavors reminiscent of Amberjack or Yellowtail. Our second wine was a much more refined affair. 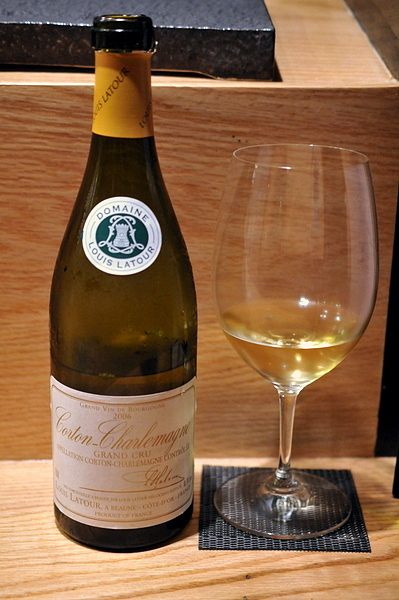 The nose is a bouquet of soft white flowers with stonefruit and just the slightest edge of acidity. The palate is much more structured and sophisticated with a mix of minerality, acid, and an undercurrent of oaky power. 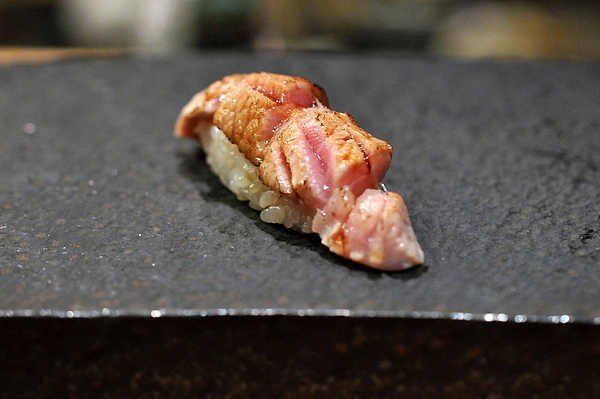 Time for another sushi interlude, this time a ruby sliver of tuna threaded with fine ivory threads of rich fat. 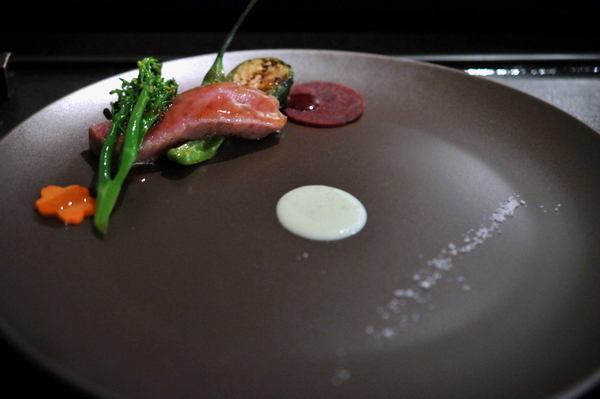 Indeed the fish exemplifies both aspects of tuna, the clean steely twang of akami intermingled with the oily richness of toro. 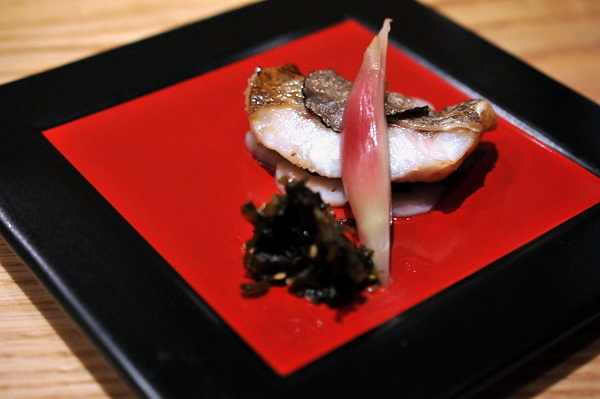 Our final composed plate centered around two immaculate flakes of grilled Blackthroat Sea Perch (Nogoduro/Akamutsu). The mild whitefish has a spry spongy mouth feel and acts as the perfect mild platform for the earthy truffle and sharp zest of the myoga. 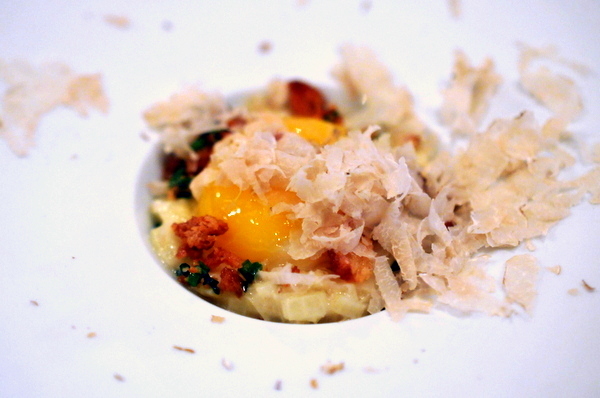 A pile of grated mustard finishes the dish, imparting a darkly spicy savor. 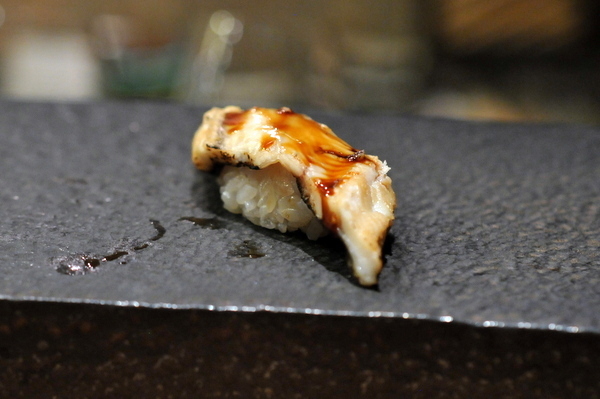 Rather than begin with the common Tai, our chef Kazu opted to start with another mild fish. The soft pinkish flesh had a touch of sinewy toughness that I found quite distinctive. Texturally this was the polar opposite of the last piece, soft and flabby, the fish had little flavor besides the classic combination of soy and wasabi. 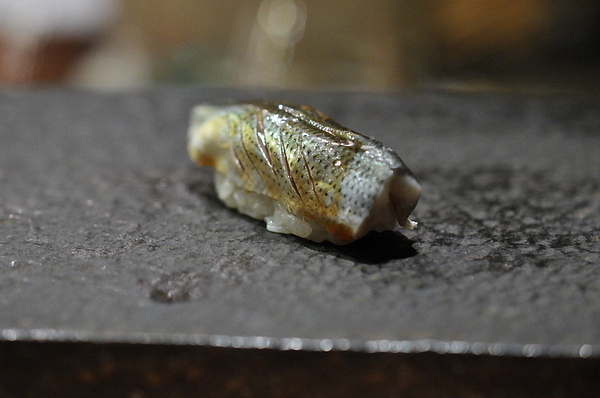 Next up was a real treat, this prized mackerel takes the name of the Saganoseki area from which it is fished. 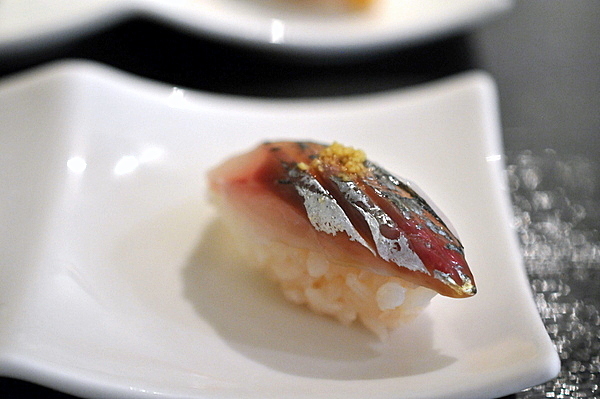 Unlike most mackerel, Seki Saba can be served uncured meaning while the fish certainly has some characteristic oiliness there are other more nuanced flavors and a more succulent mouth feel than the traditional mackerel. 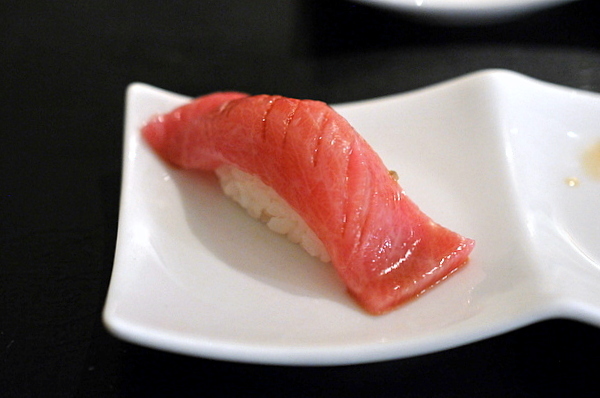 Having already tried the lean and medium tunas it was time for the O-toro to make an appearance. 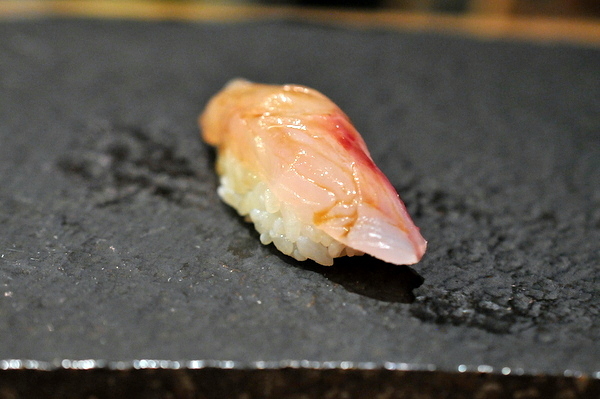 Compared to the Chu-toro, the color is several shades lighter, with larger more pronounced marbling. 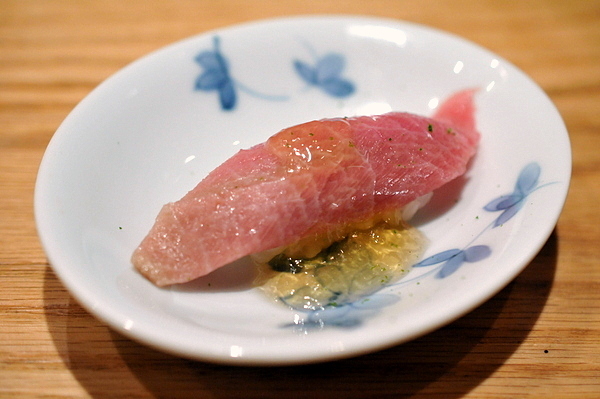 The fish came topped with an amber dashi jelly which highlighted the savory notes of the fish. 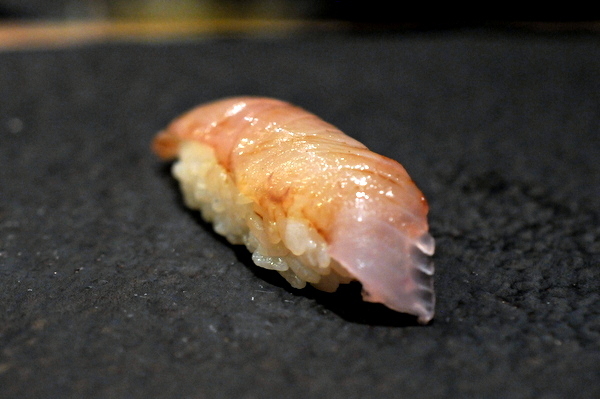 A sprinkling of yuzu zest helps hold the weightiest notes of the fish at bay. Our second wine all but dispensed with, we decided to pick up some sake to pair with the latter half of our meal. The sake is a bit blunter than I was expecting, don't go looking for flowers or fruit here, instead the booze shows off a singularly rice-y character. 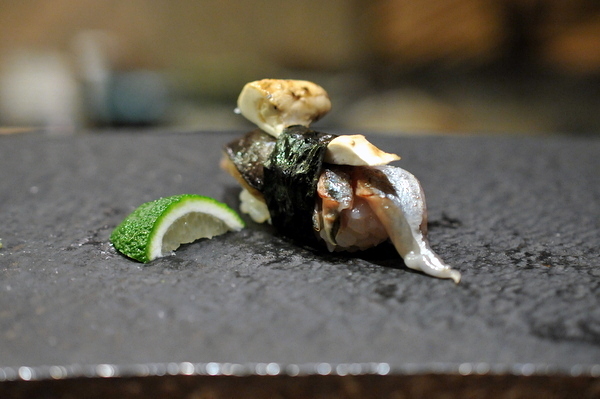 Pike Mackerel is always a treat with its distinctive oily flavor that was made to be matched with the earthy majesty of the Matsutake. 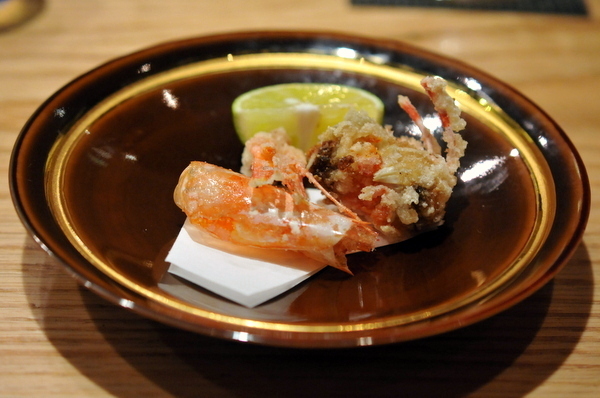 A quick squeeze of the Kabosu add a bright fragrant citrus counterpoint to the bite. 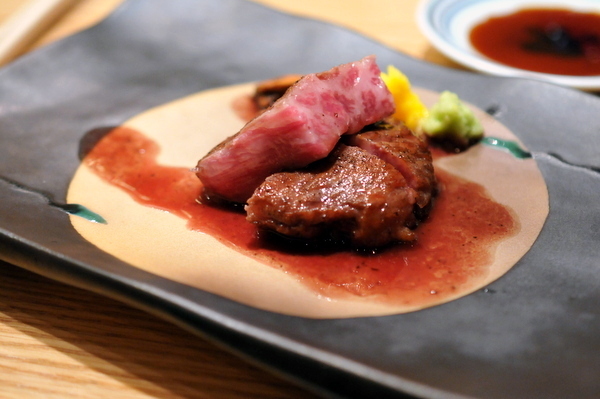 Next up was a decadent Wagyu beef from the Miyazaki Prefecture. As can be seen from the picture the veins of marbling are almost as thick as the actual meat. Indeed the rare beef was every bit as good as it looked, pairing a touch of meaty char with the buttery fat and a velvety soft texture that feels sensual on the palate. It goes without saying that the meat needed no adornment, but I enjoyed the tempering effects of the radish as well as the cleansing heat of the wasabi. 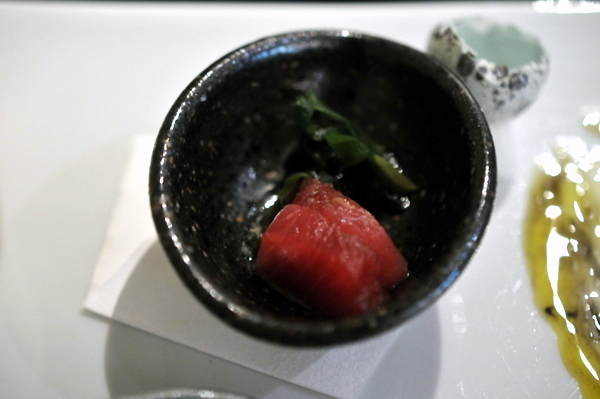 Next up was a classic pairing of salmon and sea urchin roes on a bed of sushi rice and topped with toasted seaweed. After some of the more intricate dishes this seems almost laughably simple, but the utterly pristine quality of the seafood made every last bite a delight to be savored. This was a relative rarity that I've only had once before. The sea cucumber roe is unabashedly salty with a tinge of fishiness and a chewy almost meat like texture reminiscent of beef jerky. 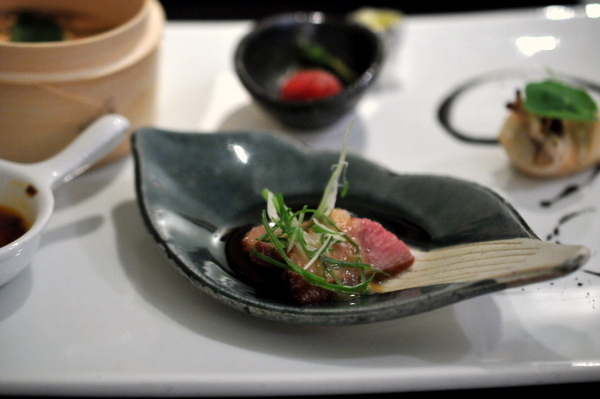 Moving back to nigiri we were presented with a seared toro that was practically dripping with smoky rendered fat. The explosive flavor leaves one craving another bite but the sheer unctuousness would get overwhelming fast. Next up was a sea bass marinated in kelp. The process dries the fish out leaving behind a denser almost tacky texture while imbuing the fish with a healthy dose of salt and glutamate. 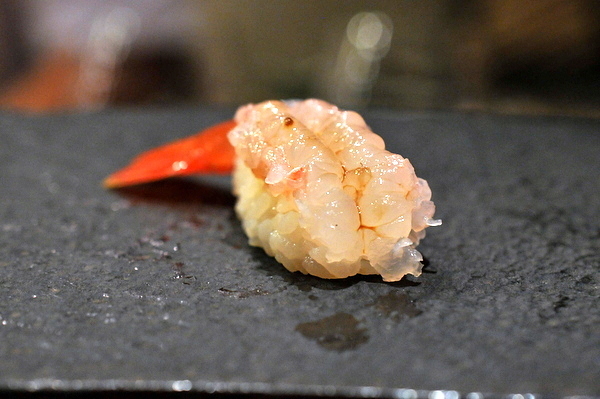 Classic Amaebi, sweet, dense and crunchy with a clean steely flavor tempered by the soy. The head was no slouch either with the exterior shell fried to a chip like crispness while the rest had a nice saline meatiness wrapped in a delicious fried sapor. Not officially part of the menu we thought this was a must order. 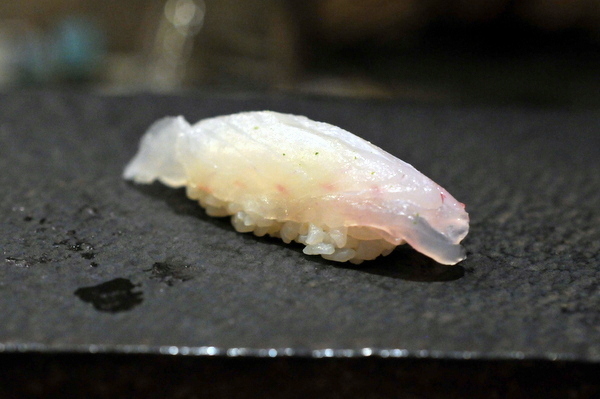 The mild white fish was a bit on the drier side, with a sticky denser texture and more apparent flavor. Still the sea salt and yuzu definitely dominate on the palate. 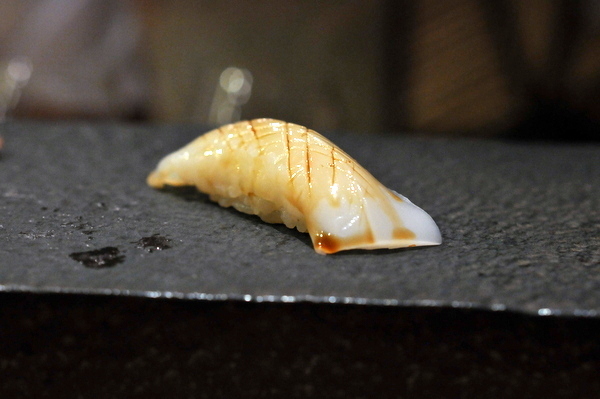 The Yari Ika starts off a bit leaner than the typical squid, but mastication still extracts the same creamy texture and subtle briny sweetness. Next up was a beautifully flecked cut of Gizzard Shad. The fish had a sharp oiliness on the attack but the flavor seemed to fade away relatively quickly making this one of the more balanced Kohada I've had. 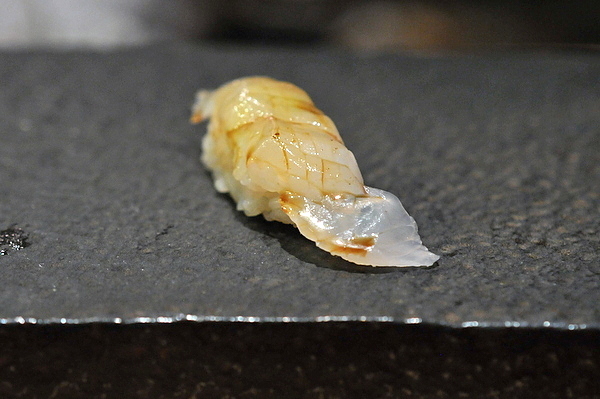 While the flavor on the Kisu was typically mild, the fish definitely had one of the most memorable textures thanks to its almost muscular snappy crunch. 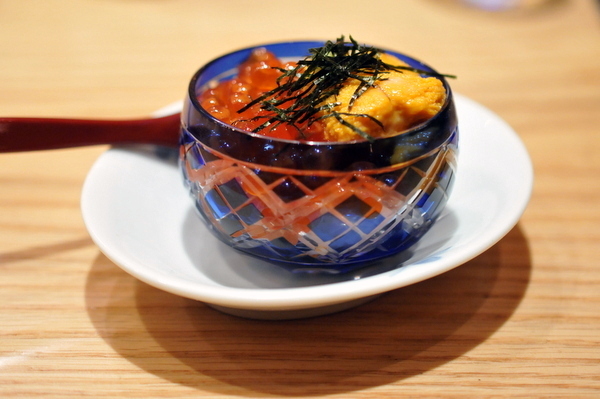 The Myoga was an unconventional but welcome bite, with the succulence and peppery bite helping to cleanse the palate of any lingering fish oil. 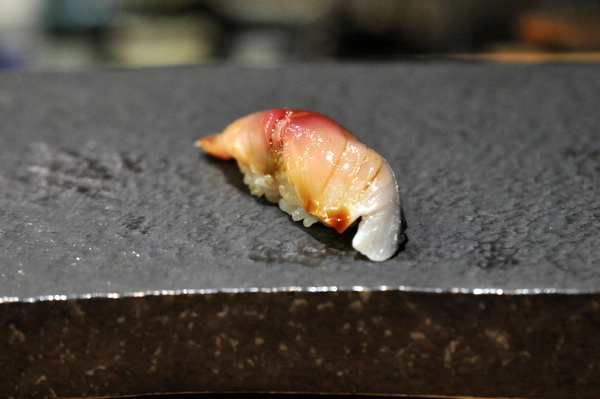 I wish more places would serve something like this to finish a long omakase. 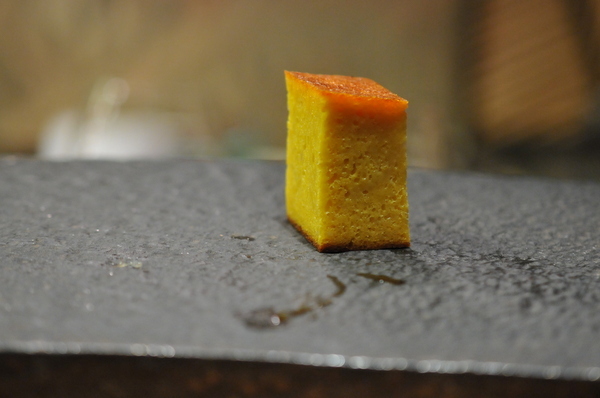 I was pleased to find Tsujita serves the Tamago in cake form rather than the classic preparation. Dense and eggy upfront there is a bit of caramelized sweetness and salinity on the back end. 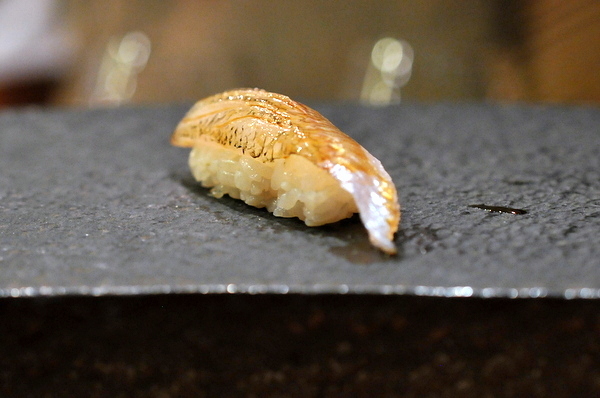 The final piece of the night was a tender Anago brushed with a generous coating of sweet sauce to compliment the eel's smoky char. This reminded me of the dessert at Kyubei in Tokyo. 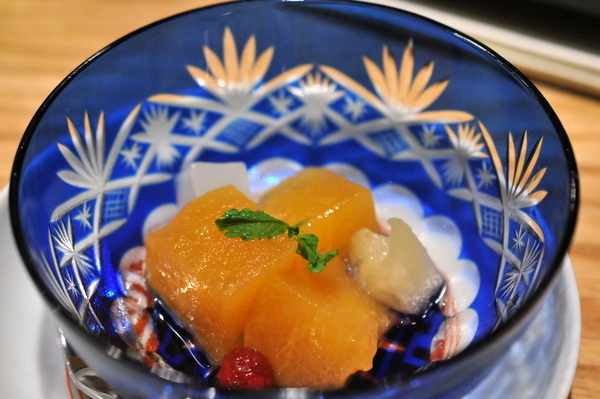 The stunningly juicy honeydew, dripping with sweetness, served as a fitting close to one of the best meals I've had all year. 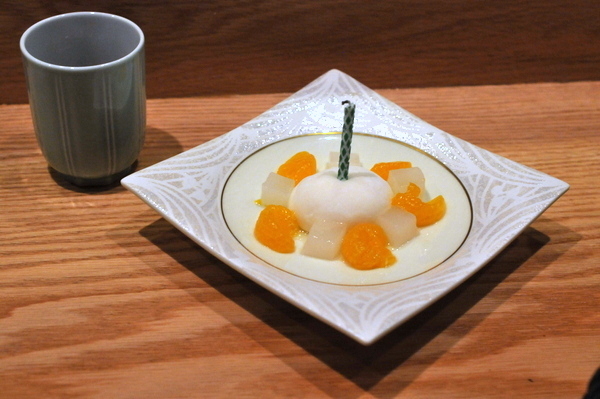 We came here to celebrate Kevin's much belated birthday so the restaurant was kind enough to whip up an impromptu birthday "cake" of mochi, jelly, and fruit. I've got to say the restaurant more than exceeded my expectations. 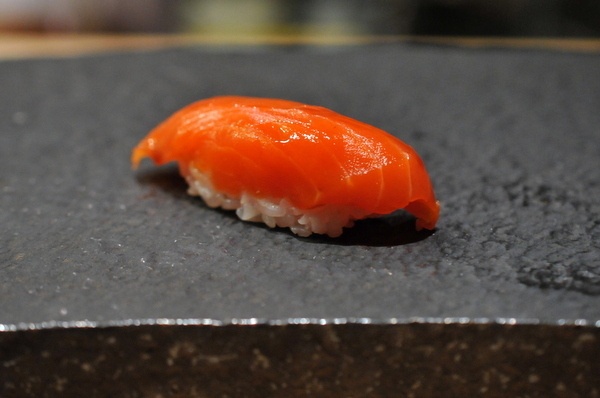 The quality seafood, thoughtfully prepared cooked dishes, and pristine nigiri make Sushi Tsujita an absolute must try.